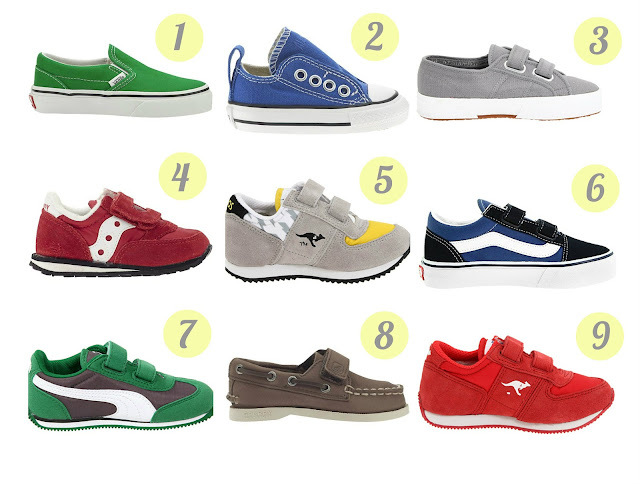 When shopping for shoes for Brody I like to look for easy on shoes, shoes that don't require my help putting them on. Here are some of my favorite easy on shoes for boys. I am a big fan of Van slip on shoes and Saucony Jazz with Velcro. Brody loves them too. We just picked up some sweet Adidas Gazelles in Green and yellow for Henry. You have to love the velcro for kids their age. I love those KangROOS! I always seem to end up going with whatever Nikes are on sale at Famous Footwear for my 3 year old...not always the most stylish, but I won't compromise on not getting a good brand name because I really think the fit and support is important for busy, active toddlers. We LOVE our Vans slip ons---so easy to get on and off, perfect for little boys and stylish!